That’s how much time has passed since Utah State fell in heartbreaking fashion to New Mexico State in the Nova Home Loans Arizona Bowl, losing 26-20 in overtime. It didn’t take long for Utah State to exact its revenge over their former Sun Belt Conference foes. Dominik Eberle and the Utah State defense put on a display Saturday night, claiming redemption over New Mexico State with a resounding 60-13 win at home. 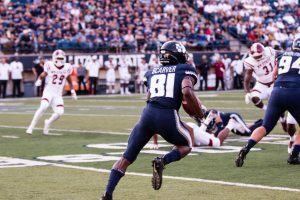 With 18,223 announced fans in attendance on a beautiful fall Cache Valley evening, Utah State began the home portion of their 2018 schedule with a bang. A lot of that redemption came at the foot of USU placekicker Dominik Eberle, who missed four field goal attempts in the bowl game loss. The junior had a record-breaking night. Eberle was six of six on field goals, and six of six on point-after attempts. All-in-all, Eberle was responsible for 24 points in the contest. His six field goals set a new school record, and Eberle tied an NCAA record for most points by a kicker in a single game. Eberle’s field goals weren’t just chip-ins, either – on three separate occasions he converted on kicks from 51 yards out. Eberle also recorded 10 touchbacks on 13 kickoffs Saturday night. USU’s special teams really were special in the home-opener. Eberle started the game with a pair of field goals on consecutive drives early in the first quarter. New Mexico state responded with a 10-play, 75-yard drive that ended in an 18-yard pass from Matt Romero to Johnathan Boone to take a 7-6 lead. They held onto that lead for a mere 15 seconds – thanks to USU kick returner Savon Scarver. The speedster and former track-and-field star fielded the ensuing kickoff with his heels on the goal line. Scarver took off down the east hash mark, before bouncing to the sideline near the 25-yard line. Jalen Greene threw a key block, and Scarver had all of the daylight he needed. It ended 100 yards later, in the end zone. The electric play was Scarver’s second career TD on a kickoff return, both of which came against NMSU – other one took place in the Arizona Bowl last year. Scarver’s TD sparked a scoring onslaught by the Aggies in blue. Utah State proceeded to outscore their opponents 20-3 over the remainder of the first half. Eberle made two more field goals, and the Aggies found paydirt on the ground and through the air in the second quarter. Eltoro Allen punched in a 1-yard touchdown on the ground to put USU up 23-10 with 5:46 left in the 2nd quarter. 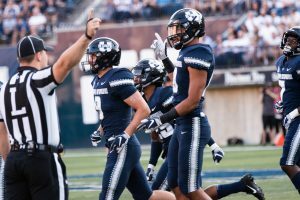 Two possessions later, USU quarterback Jordan Love found Jalen Greene in the endzone for a 14-yard touchdown to make it 33-10 just before halftime. Greene found himself in one-on-one coverage, and hauled in the well-thrown ball even through a pass interference call on the NMSU defender. 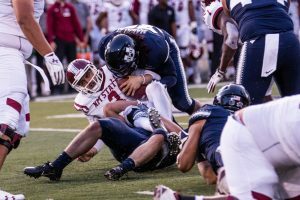 The Aggies of the Utah State variety kept their collective foot on the gas pedal in the second half, in large part due to their defensive prowess. All-in-all, they made life tough for the New Mexico State offense. USU recorded a total of 5 sacks, while only surrendering 109 yards on the ground to NMSU. Utah State forced five turnovers, with two fumbles and three interceptions. Aaron Wade had a monster game. In his first career start, the senior safety made play after play. Wade intercepted two passes and recorded 10 tackles, including a sack. Deante Fortenberry snagged the other interception for the Aggies, and he made it count. Fontenberry ran the pick back for a 75-yard touchdown midway through the third quarter. Tipa Galiea and David Woodward caused havoc with their pass-rush efforts. Woodward had a team-high 13 tackles and a sack. Galiea had a pair of sacks, a tackle-for-loss, six tackles and a forced fumble. Defensive end Adewale Adeoye recovered both of NMSU’s lost fumbles. The second half featured a pair of big-plays from different USU running backs. Gerold Bright took a handoff towards the end of the third quarter and ran it 51 yards for a score to put Utah State up 47-13. USU offensive linemen Sean Taylor and Rob Casteneda opened up a massive hole for Bright, and he hit the jets to go into the endzone untouched. “When you see daylight, you’ve got to go,” Bright said. The junior finished with a career-high 135 yards on 14 carries. Darwin Thompson opened the fourth quarter with a long touchdown run of his own. Thompson scored on a 68-yard run, and USU went up 54-13. Thompson picked up 96 yards on 6 rushes, for a whopping average of 16 yards per carry. Utah State amassed 446 yards of total offense.